Radio Control System - Orion Systems Inc. 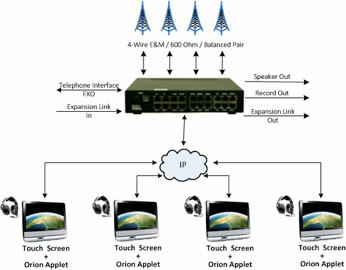 The Orion Systems Radio Control System (RCS-4-IP) interconnects multiple 4-Wire E&M radios to operator consoles using Voice over IP (VoIP) / Radio over IP (RoIP) transport. The basic building block of the Radio Control System is an Orion Systems RCS-4-IP device. The RCS-4-IP device is equipped with four 4-Wire E&M Radio interfaces, one Telco (2-wire) interface, and supports up to 4 operator consoles. Each operator console has independent non-blocking Tx/Rx radio communication. The RCS-4-IP system is capable of transmitting and receiving audio simultaneously on all radio nets and also includes two local intercom nets for operator console to operator console communication. Each radio interface consists of 600 Ω balanced analog transmit and receive audio pair. Radio keying options include solid state contact closure (E&M) or EIA Tone keying. Radio control can be accomplished via optional RS232 interfaces, parallel interfaces, or opto coupled interfaces. An operator console controls the RCS-4-IP system using a standard computer and mouse or a touch screen computer. The Orion Systems applet displays all the interfaces of the RCS-4-IP system. Each interface displayed has the following Talk/Listen options – Transceive, Monitor only, or Mute. Each interface includes per circuit volume, audio present, and circuit ID. The RCS-4-IP system also supports interoperability by allowing an operator to initiate Radio-to-Radio or Radio-to-Telephone patch. Patch selections automatically initiate VOX keying. Multiple RCS-4-IP devices can be interconnected to control up to 12 radios, 12 operators, and 3 Telephones.